Northeast Scout Ian Cundall takes our first look at two new pitchers in the system and follows up on one position player he scouted during the season. -Having never seen Simon Mercedes pitch before, I wasn’t sure what to expect. Mercedes is a big man, listed at 6-foot-4 200 pounds, with the weight listing pretty generous. He is well built and I don’t see much physical projection with the body. His delivery was a little stiff and his mechanics need work, as he doesn’t utilize his size to his advantage as much as he could. He throws straight over the top and has a loose arm, clocking 91-94 mph with his fastball. The pitch doesn’t have much movement and the command is presently fringe-average, but in the future with cleaned up mechanics, he could add velocity. Mercedes’ low-80s curveball is a true 12-6 offering, showing tight spin and depth when he got on top of the ball. He has the tendency, however, to release the pitch too late resulting in it ending up in the dirt. The 85-87 mph changeup is also inconsistent, as times looking more like a fastball he took something off of. The pitch did show drop on occasion, with the makings of a swing and miss offering. For profiles of the top 10 prospects, read on at ESPNBoston.com. With the rest of the affiliates done for the year, the only remaining squad playing games was Pawtucket who faced off against the Reno Aces, an affiliate of the Arizona Diamondbacks, in the Triple-A championship game. The impressive season for the PawSox came to an end with the 10-3 loss. SoxProspects.com's Senior Staff Writer John Gray gives more details on the game and some individual performances. It was a big week and season for the PawSox, but it was also a big week for SoxProspects.com as we celebrated our 9th anniversary on Thursday. SoxProspects.com's Executive Editor Chis Hatfield looks back nine years to when Mike Andrews started the site, and highlights some key developments over the years. The site has come a long way over the years, and - due in large part to the interest from the fans - has grown to a staff of 23, receiving over 15-million page hits a year. It's difficult to believe that it has been nine years since Mike Andrews started SoxProspects.com on September 20, 2003. That October, the site looked something like this. Although the Red Sox farm system had some good future MLB talent in players like Hanley Ramirez, Kevin Youkilis, "John" Lester, Jorge De La Rosa, David Murphy, and Kelly Shoppach, and although Mike had them mostly (hello Chad Spann) pegged correctly as the system's top prospects, both the system and the website have come a long way since then. The Red Sox won two championships after that date, while SoxProspects.com has grown to an incorporated entity receiving more than 15-million page hits per year and a staff of 23. 9/19 Cup of Coffee: Pawtucket's magical season came to an end Tuesday night as they dropped a 10-3 decision to the Reno Aces (AZ) in the Triple-A championship game. Nelson Figueroa received the start for Pawtucket, looking to win yet another important game after receiving the victories in both the semi-final clincher and the Governor's Cup finale. However, Figueroa could not replicate his magic, lasting just 2.0 innings, allowing six runs on seven hits while striking out two as he received the loss. Now that the 2012 minor league season is over, here’s a look at the statistical leaguers from the Red Sox minor league system, on ESPN Boston. All stats are cumulative for all minor league levels within the organization, but do not include major league stats. Minimums for percentage stats are 250 at-bats for hitters and 80 innings pitched. 9/14 Cup of Coffee: For the first time in 28 years, the Pawtucket Red Sox are International League Champions. A 4-1 win on Thursday night completed their three game sweep of the Charlotte Knights (CWS) to win the Governors' Cup. Nelson Figueroa, the PawSox 38-year-old veteran, continued his pitching dominance Thursday night. Picked up at midseason after being released by the Yankees organization, the Brandeis alumnus pitched 6.0 strong innings, allowing one run on seven hits. He struck out five, and did not walk a batter as he earned his second win of the postseason. The PawSox jumped off to a 2-0 lead in the second inning. With Andy LaRoche and Danny Valencia in scoring position, Mike Rivera looped a one-out base hit in front of left fielder Jared Mitchell. Valencia came in to score, while LaRoche held up at third, not wanting to test Mitchell's strong arm. After a Ryan Dent walk, Che-hsuan Lin was able to score LaRoche on a sacrifice fly. PAWTUCKET, R.I. – Coming off his debut in a Boston Red Sox uniform, a start in which he allowed nine runs in three innings of work, Zach Stewart (pictured) is now 2-0 in the playoffs for Pawtucket since returning to the team. Thursday night Stewart had one of his best starts with the organization, tossing six shutout innings against the Charlotte Knights in Game Two of the Governors’ Cup finals. 9/13 Cup of Coffee: Zach Stewart pitched 6.0 scoreless innings and the PawSox defeated the Charlotte Knights (CWS), 2-0 for a two-game lead in the International League finals. If the PawSox win tonight, they will secure their first Governors' Cup since 1984. Stewart scattered four hits over his 6.0 innings of work, struck out four and walked only one. The PawSox bullpen didn’t even yield a hit to the Knights over the final three innings. Only two men reached base—both on walks from Pedro Beato—but otherwise, Beato, Alex Wilson, and Jose De La Torre combined for three spectacular innings to seal the deal. 9/12 Cup of Coffee: Appearing in their first Governor's Cup since 2003, Pawtucket had an impressive night at the plate as they grabbed a 7-2 victory over the Charlotte Knights (CHW) in game one of the International League Finals. The teams traded runs in the first inning and entered the third inning tied 1-1. In the bottom half of the third, Danny Valencia's (pictured) two-run home run gave the PawSox a 3-1 advantage. Pawtucket held a 4-2 lead after four and opened up the game in the seventh when Tony Thomas smacked a two-run home run and J.C. Linares added a solo shot. The SoxProspects.com community has voted on its selections for the 2012 year-end All-Stars. Included on the list are some familiar faces, along with breakout prospects who were not on the radar when the season began. For the third consecutive season, the Yale graduate was honored for his continued excellent work behind the plate. 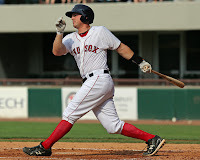 Lavarnway got off to a slow start with Pawtucket, but turned around to post a .295/.376/.439 line, winning SoxProspects.com Player of the Month honors in June. 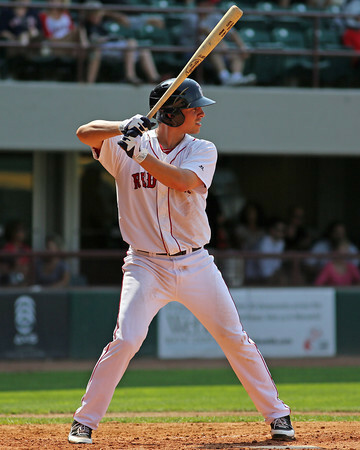 In addition to his noted offensive prowess, Lavarnway also earned plaudits for his defense in 2012, as he was recognized by International League managers as the top defensive catcher in the circuit. The six-foot-four backstop, ranked the #5 prospect in the system on SoxProspects.com was promoted to Boston on August 1. SoxProspects.com Player of the Month of August Portland's Xander Bogaerts hit .321/.349/.617 (26-for-81) with five home runs and nine doubles in 20 games. He also batted in 17 runs, scored 12 and stole a base (1 CS). Bogaerts finishes the 2012 season with a .307/.373/.523 line (146-for-476) with 20 home runs, 37 doubles, three triples, and 81 runs batted in over 127 games (23 with Portland, 104 with Salem). 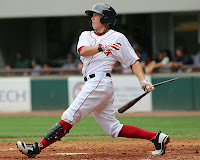 He was also voted SoxProspects.com Player of the Week of July 30-August 5th. Bogaerts is currently the top-ranked prospect in the organization by SoxProspects.com. For prospects rising up the ranks, being promoted to the next level is always the short-term goal, but the adjustments necessary to succeed upon arriving can also be the most challenging aspect of their journey to the major leagues. This season, two new Pawtucket Red Sox outfielders are making their adjustments to the highest minor-league level in the thick of a playoff run -- Bryce Brentz and Jeremy Hazelbaker. During the 2012 season many players had impressive individual performances. The players listed below were voted by the SoxProspects.com community as Players of the Year based on their outstanding seasons. After winning breakout player of the year honors last season, Bogaerts takes home Offensive Player of the Year honors in 2012. Widely regarded as the Red Sox top prospect, Bogaerts followed up his breakout 2011 campaign with an even more impressive 2012. The 19-year-old shortstop hit .307/.373/.523 with 20 home runs, 81 RBI and 37 doubles between High-A Salem and Double-A Portland. Bogaerts continued to rack up accolades, being named a Carolina League All-Star and being named to the World Team in the MLB Futures Game. Currently ranked first overall on SoxProspects.com, Bogaerts will look to continue his rapid ascent towards the majors in 2013. A few weeks back, I wrote about the position player prospects pushing towards the majors in the upper levels of the organization and touched on the overall depth within the system. Don’t worry, I didn’t forget about the young crop in the lower levels. Let’s take a look at that group and how the development played out in 2012. Assessment: Just when Cecchini was beginning to put things together in his debut season with Lowell during 2011, he suffered a broken bone in his hand leading to some lost development time. Looking noticeably more filled out in the lower body down at spring training, Cecchini continued to show a sweet swing from the left side of the plate and the ability to square the ball up with backspin. When I caught him during my swing down through the southern affiliates the big thing that stuck out was the improvement on the defensive side of the game. Previously scouting on the rigid side and slow with his reads, Cecchini was much more fluid and quicker with his reactions. He still has some work ahead of him, but I see the potential to round into a solid-average-to-better defender at the position. While he is rough with breaking balls, he stays back well on fastballs and is willing to work deep into counts. The swing can get messy at times though. It’s something for him to continue to work on as he progresses into High A next season. Cecchini has the strength and batspeed to drive the ball into both gaps. He needs work improving the leverage created at the point of contact, but I see the raw power to develop into an 18-20 home run hitter as he matures. Progress picking up breaking balls quicker out of opposing pitchers’ hands will help him transition more quickly into the Carolina League. Cecchini’s a developing position player, who made good strides in 2012 while picking up valuable experience in his first full professional season. After a heart-breaking loss on Friday night, the PawSox came back to dominate the Scranton/Wilkes-Barre Yankees (NYY) and advance to the Governors' Cup Finals with a 7-1 win. The game was won in the second inning when all but two PawSox players had a hit. After six singles plated four runs, Danny Valencia (pictured) blasted a three-run home run to give Pawtucket a commanding seven-run lead. That was more than enough for Nelson Figueroa, who threw 8.0 brilliant innings, allowing one run on two hits, walking one and striking out eight. The lone Yankees run scored on a fourth-inning home run from Corban Joseph. Alex Wilson replaced Figueroa in the ninth and set down the side in order to secure the victory. 9/8 Cup of Coffee: With a 3-1 lead going into the bottom of the ninth, it seemed like the PawSox were in the perfect position to sweep the best-of-five series against the Scranton/Wilkes-Barre Yankees. But Melky Mesa hit a walk-off two-run home run, and the Yankees defeated the PawSox, 4-3 at the last possible second. Billy Buckner (pictured) started the game and yielded only a hit over his 6.1 scoreless innings and struck out seven. Brock Huntzinger gave up a run on two hits over his 1.2 innings of work. Tony Pena, Jr. came in the bottom of the ninth and the PawSox still maintained a comfortable 3-1 lead. But Pena gave up a leadoff double and a single to trim the lead to only a run. Pena departed with one out in favor of Pedro Beato. Beato elicited a pop out from the first batter he faced for the second out, but promptly gave up the walk-off home run that kept the Yankees in the International League semi-finals. Before getting into the system news, some important site information. After receiving a great deal of input the SoxProspects.com forum has moved to ProBoards. 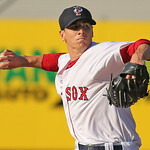 Visit at http://forum.soxprospects.com. As the Red Sox prepare for what should be an eventful offseason, sign up now and join the conversation. While the first week in September traditionally marks the roster expansion and, with it, a bevy of roster moves, the Red Sox fall from contention coupled with Pawtucket's postseason appearance has delayed the annual migration up I-95. Some exceptions: Daniel Bard was recalled on Saturday, and Chris Carpenter (pictured) followed on Sunday. Clayton Mortensen was recalled for the sixth time on the year, and Rich Hill was activated from the disabled list. Ivan DeJesus, acquired from the Dodgers in last week's mega-deal, was the only position player to get the call. PAWTUCKET, R.I. – Left-hander Chris Hernandez looked like he was beginning to come unraveled in the second inning of Thursday's playoff game against the Scranton/Wilkes-Barre Yankees. With one out and a run already in, Hernandez dropped the ball while on the rubber for a balk to move the runner to third, then relinquished the the second run of the inning on a groundball single. However, Hernandez stopped the bleeding there, picking up the final two outs of the inning on strikeouts. He would allow just one more hit and no further runs in his six innings of work, putting the team in position to take a commanding 2-0 lead in the best-of-five playoff series by the end of the night. 9/7 Cup of Coffee: For the second consecutive night Pawtucket came from behind, beating the Scranton/Wilkes-Barre Yankees (NYY) 3-2 to take a 2-0 lead in the best of five International League semifinal. The Yankees struck first as Chris Hernandez struggled through a tough second inning, allowing three hits, a walk and a balk as Scranton got out to a 2-0 lead. The PawSox lefty soon settled into a groove though, striking out Kevin Russo to get out of the second to start a run of seven consecutive batters he retired. Overall, Hernandez was able to get through 6.0 strong innings, giving up only those two runs on four hits, He struck out five and walked two. It was another solid outing for Hernandez, who, despite only being credited with one win after his promotion to Pawtucket, pitched quite well, posting a 3.59 ERA in 42.2 innings over eight appearances. In the final polls of the year Greenville's Garin Cecchini narrowly edged Pawtucket's Dan Butler by a single vote for SoxProspects.com Player of the Week honors while Pawtucket's Nelson Figueroa bested the Pitcher of the Week field by a large margin. Cecchini batted .350/.519/.700 line (7-for-20) for the week with five doubles and a triple, scoring five runs while batting in six, taking six bases on balls, and stealing five bases as a runner. His season ends with a .305/.394/.433 line (139-for-455), hitting four home runs, 38 doubles and three triples over 118 games. Checchini also stole an impressive 51 bases while only being caught six times. 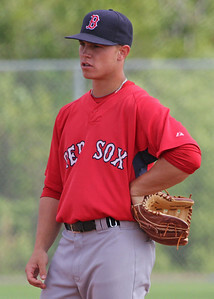 He is currently the ninth-ranked prospect in the organization by SoxProspects.com. 9/6 Cup of Coffee: Bryce Brentz hit his first home run for the PawSox, who won the first game of the International League semi-finals, and the Spinners found victory in their final game of the season. The PawSox recovered from a four-run deficit to take the first game of the International League semi-finals against the Scranton/Wilkes-Barre Yankees, 7-4. Tony Thomas (pictured) catalyzed the PawSox charge with his first double of the day and Juan Carlos Linares followed with a two-run blast to trim the deficit to two runs. Andy LaRoche hit a solo shot to put the PawSox within a run. LaRoche came through again in the fifth inning with a two-run double to give the PawSox the lead that they would maintain for the rest of the game. Bryce Brentz hit a two-run homerun, his first at the Triple-A level to give the PawSox some extra insurance runs. Zack Stewart started the game, allowing four runs on seven hits over 5.0 innings. Alex Wilson, Pedro Beato, and Jose De La Torre combined for four scoreless innings out of the bullpen. 9/5 Cup of Coffee: With the minor league season all but complete, Lowell was the lone affiliate in action on Tuesday, preventing Brooklyn from clinching a wild card spot. A 13-hit performance and solid pitching vaulted the Spinners over the Cyclones (NYM), 9-1. Austin Maddox (pictured) made his Lowell debut, hurling 3.0 scoreless innings, allowing two hits and a walk while striking out four. 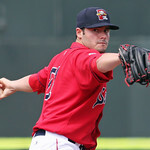 Mike Augliera picked up his first professional victory by tossing 3.1 scoreless inning of relief, allowing just two hits and striking out three. The Spinners wasted no time getting on the board, plating two runs in the first on an RBI groundout by Deven Marrero and an RBI single from Jake Davies. After Brooklyn cut the lead in half in the fifth, the Spinners opened up a 4-1 advantage in the sixth on an two-RBI single from Aneury Tavarez. Coming off a breakout full-season debut in 2011 with Greenville that catapulted him further onto the prospect radar, second baseman Sean Coyle needed a half-season of disappointing results and a trip back home to Pennsylvania to rediscover his swing and salvage his 2012 campaign with Salem. SoxProspects.com Northeast Scout Ian Cundall files his latest report after spending the last week covering Portland. -Since his promotion to Double-A Portland, Xander Bogaerts has shown the tools that make him the top prospect in the system. Any talk of promoting him further, however is premature and last week in New Hampshire provided a perfect snapshot of the areas Bogaerts has to improve upon specifically at the plate as he heads into next season. In one look, Bogaerts went 0 for 5 including three strikeouts, two of which were swinging, and looked uncomfortable all night. Furthermore, he received a steady diet of off-speed pitches, which kept him off-balance. In almost every at-bat he expanded his zone, chasing both sliders and changeups out of the strike zone. His fourth at-bat highlighted all these struggles as he got caught way out in front of a 1-1 slider down and away. With the count then 1-2, Bogaerts got a mistake pitch, a hanging slider belt high, but again he was out in front and only able to foul it off. The following pitch was a changeup, but again he was caught out on his front foot and swung over the top of it. Bogaerts' struggles didn’t end with breaking balls as his timing was off against fastball as well. Throughout the evening he was jumping at the ball rather than staying back and letting the ball get deep then using has hands to drive the ball as he has in past scouting looks. The most notable instance of this came in his third at-bat when he reached for and missed a 2-2 fastball off the outside corner of the plate with a weak swing. After weeks of back-end work, this morning we changed forum hosts from Yuku to Proboards. The new Forum is located at http://forum.soxprospects.com. The Yuku forum is now locked down, and all links off of the main navigation bars throughout SoxProspects.com now re-route to the new board. If you haven't done so yet, members will have to sign up for new accounts on the new board. 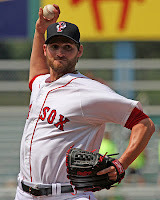 9/4 Cup of Coffee: The book on the 2012 season closed Monday for three of the Red Sox affiliates. Salem and Greenville both ended the year with victories, while Portland dropped its finale. The regular season also came to an end for Pawtucket, which beat Scranton/Wilkes-Barre to split its four game series. Pawtucket and Scranton will become even more familiar with each other, as the two clubs begin a best of five series in the International League semi-finals on Wednesday. Lowell, the only Sox affiliate with games remaining after Monday, took the loss. In its final regular season tune-up, Pawtucket knocked off the Scranton/Wilkes-Barre Yankees (NYY), 6-4 in 12 innings. With Jeremy Hazelbaker on second and one out in the bottom of the twelfth, slugger Juan Carlos Linares drove a deep fly over the left field seats to close the regular season in stunning fashion. Linares also doubled in the game – his second back from the disabled list – to go 2 for 6 with two RBI and a run scored. Jon Hee (pictured) had a big afternoon for Pawtucket. At the plate, the shortstop reached base four times, going 3 for 5 with a walk and two RBI. Hee then took the mound to pitch a 1-2-3 twelfth inning, getting credit for the victory after Linares hit his walk-off. After beginning his Triple-A career 0 for 12, Bryce Brentz singled down the third base line in the second inning, and followed up with another base hit in the seventh. Brentz finished the night 2 for 5. 9/3 Cup of Coffee: Allen Webster had a tough end to his strong 2012 campaign, Keury De La Cruz and Garin Cecchini each reached big milestones, but it was a first-inning catch in Pawtucket that stole the show on Sunday. Jason Repko (pictured) made one of the best catches you will ever see in the PawSox 6-2 loss to the Scranton/Wilkes-Barre Yankees (NYY). With the bases loaded and nobody out in the first, Kosuke Fukodome hit a deep fly ball to left. Running full speed, Repko jumped, reached over the fence, and flipped over the wall into the PawSox bullpen to take a grand slam away. You can watch the play here. Check out the Red Sox minor league notes for the month of August on ESPN Boston. 9/2 Cup of Coffee: The PawSox won the Wild Card for the second consecutive year, Stolmy Pimentel ended his season on a high note, and William Cuevas put an exclamation point on his dominant season. Nelson Figueroa threw 8.0 shutout innings, and Dan Butler connected for two home runs as the PawSox beat the Scranton/Wilkes-Barre Yankees (NYY) 2-0 to clinch the International League Wild Card spot. Figueroa was brilliant, allowing only five baserunners and striking out six on his way to his 12th win of the season. Butler provided all the offense, blasting a solo home run in the sixth and seventh innings to put the PawSox on top. Josh Fields pitched a perfect ninth to earn his fourth save and keep his Triple-A ERA at zero over 12.2 innings. 9/1 Cup of Coffee: The Sea Dogs erupted for 13 runs, and Henry Owens pitched 5.0 scoreless innings for Greenville. A couple of late-inning meltdowns plagued the PawSox and the Salem Red Sox, and the Spinners' pitching was just barely out-dueled. A rocky start to his seventh inning disrupted an otherwise solid start from Chris Hernandez, and the PawSox fell to the Scranton/Wilkes-Barre Yankees, 4-3. Hernandez allowed only one run over his first six frames, but he yielded back-to-back homeruns to lead off the seventh inning. Hernandez was unable to record an out in the seventh inning, and departed in favor of Pedro Beato, who allowed an unearned run in his inning of work. In total, Hernandez allowed three runs on seven hits over his 6.0 innings of work. Brock Huntzinger also pitched 2.0 scoreless innings. Danny Valencia gave the PawSox an initial two-run lead with his two-run homerun in the first, but the Yankees cut that lead in half in the second. A pivotal three-run seventh inning gave the Yankees just enough to put the game out-of-reach for the PawSox, who managed only a run as a response on a RBI triple from Jason Repko in the bottom of the seventh. Jeremy Hazelbaker was 3 for 4 on the day, and has at least a hit in four consecutive games after going 0 for 4 in his Triple-A debut. Despite the loss, the PawSox still maintained their three-game lead in the International League wildcard.